A high-quality treadmill, and a strong workout product from ProForm’s PRO line. 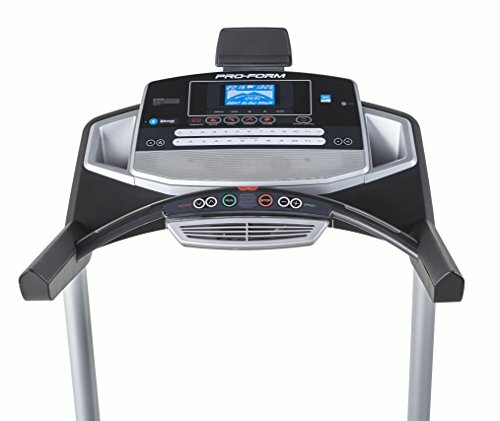 This is a high-performance machine designed to provide runners with a multitude of running options and extra features geared at making the machine more user-friendly. Serious athletes and dedicated runners: This treadmill is great for daily use and comes with a shock-cushioned track to help alleviate the long-term impact of running on your joints. Multitaskers: The PRO 1000’s 10” touchscreen allows you to check your email or surf the web while you’re running. It also has a tablet dock if you’re looking to take on a few different tasks at once or knock out a season or two on Netflix while you run. The treadmill is smartphone compatible, so you can listen to your favourite playlist while you work out. Stat trackers: Like any good treadmill, the ProForm PRO 1000 tracks calories, speed, distance traveled, degree of incline, and workout time and also comes with a wireless EKG heart rate monitor as well as handrail heart rate detectors. 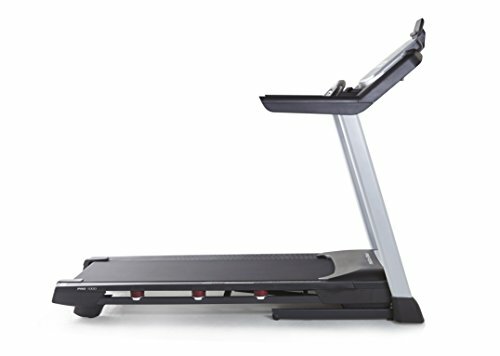 Fast runners: This treadmill is capable of speeds up to 12 MPH and comes equipped with a high-powered cooling fan so you can comfortably work on your run times. Long-legged runners: The 20”x 60” track provides a comfortable running space regardless of your height or your stride. iFit users: The PRO 1000 treadmill is iFit compatible and through iFit, runners can access additional features such as personalized workouts and competitive running. Space-savers: This treadmill folds up vertically to free up space while not in use or for storage purposes. A variety of pre-set workouts that target a myriad of workout goals from weight loss to endurance running. An incline-enabled track to simulate different running conditions. Transportability: At 250 pounds, this treadmill isn’t exactly light. If you’re looking for a treadmill that’s relatively easy to move, you may want to consider lighter substitutes. Easy Assembly: The installation of this treadmill is likely going to require you to phone a friend to help you out, and the instructions aren’t entirely intuitive for those who may have a little trouble assembling things. Electronics Warranty: If you tend to have bad luck with electronics, you may want to think twice before selecting this machine, as there’s no warranty on its electronic components. iFit Wireless Adaptor: This treadmill is iFit compatible, however the required wireless adaptor is sold separately. Affordability: The price range for this product falls in the 4-digit range. 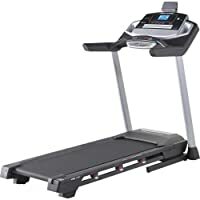 The price tag can be a real deterrent for some, since many of the features of this treadmill are included on other, less expensive treadmill models. While the cost of the ProForm PRO 1000 is something to consider, it may well be worth it if you’re looking for a high-performance machine with a lot of options. This machine has plenty of choices for users when it comes to types of workouts available and media accessibility. It’s not going to be easy to set up, but once you have it installed, you’ll be able to fold it up when you’re not using it, and if your machine happens to malfunction, chances are the warranty’s got you covered. If you’re willing to make the investment, the variety of features and long-lasting hardware will make it worth your while.